Growing up Chinese, I was familiar with “jook,” what my parents translated as rice soup. What my non-Chinese friends called “congee.” If you search for “jook” or “congee” in Wikipedia, you get a better discussion on the dish. This post however, is about Cai Pao Fan, literally “vegetable, pour hot water, rice.” I didn’t know this dish existed until a couple of years ago. To make jook, rice (either raw or already cooked) is simmered with lots of water until the rice breaks down into a starchy porridge (think oatmeal). Jook is found throughout asia under various names (again, see Wikipedia). 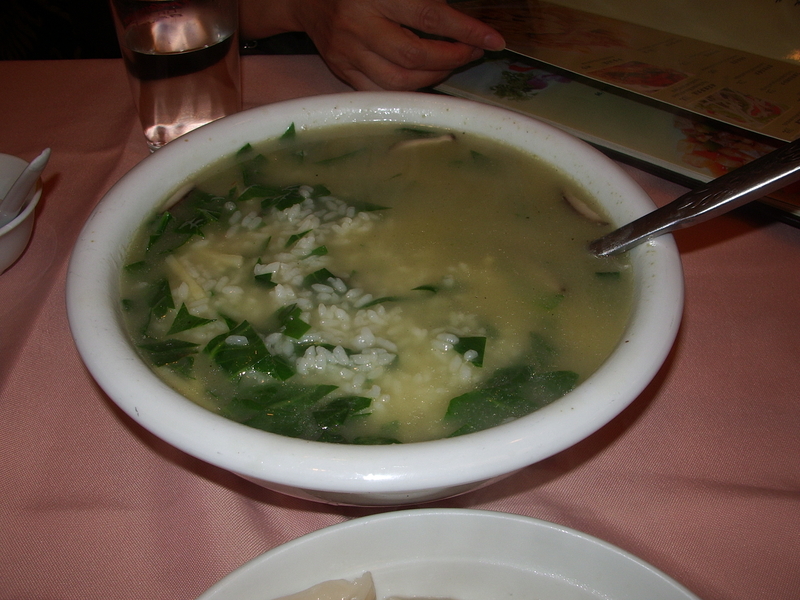 The basic jook is eaten with various pickles and other savory small dishes. Salted duck eggs or “century eggs” are ingedients that accompany jook. Pao fan, on the other hand is leftover cooked rice that is simmered with a fair amount of water for a short time. The rice keeps its shape and hasn’t broken down to a porridge consistency. Where jook takes a while to make, pao fan is relatively quick. According to The Cat, Cai Pao Fan was very common in Shanghai when she was growing up. Cai Pao Fan usually has rice, vegetables, and sometimes meat (if available). The vegetables can either be leftover or fresh (usually green leafy vegetables). The meat can be leftover, fresh or salted. Sometimes, if available, oil (such as roasted sesame oil) would be drizzled on at the end to add a little bit of aroma and flavor. It was a way for families to use up leftover rice, vegetables, and meat in a one-pot meal that was quick and easy. It was also a way to stretch limited food resources to make a meal. In fact, one of her fondest memories is her father making the best Cai Pao Fan she ate, ever. Her father used pork fat drippings, fried green onions, green vegetables, and rice to make her lunch. She was preschool age and still remembers the taste and smell. Cai Pao Fan is one of the first dishes we order when we travel to Shanghai. It’s warm, easy to digest, and taste good. The Cat said that with Shanghai becoming more westernized, Cai Pao Fan is slowly becoming less and less common as “home food.” Its saving grace, for now, is that people are nostalgic for dishes like Cai Pao Fan for restaurants to offer it on their menus. Who would have thought? Here’s what it looks like at a family style restaurant we frequented in Shanghai. This one didn’t have meat. You can see the rice and vegetable leaves. There is also bits of bamboo shoots and dried shiitake vegetables. The restaurant used chicken stock for the broth. It kind of reminds me of the chicken and rice or chicken and stars soup that my mother use to make out of the can, but this tastes much better. I’ve made this a couple of times at home. I like to have a little meat in my versions. Sometimes its with leftover kal bi, teri chicken, or pork hash that we take home from restaurants. I’m sure my versions doesn’t even compare with the one The Cat’s father made. This post is dedicated to The Cat’s father. The Cat likes soupy food. I look forward to trying this dish! Think Chinese style risotto without the butter. Good luck! I have tasted something similar once and loved it. The one I tasted was a seafood dish so the rice was cooked with a varieties of seafood soup. I will try your vegetarian version. Looks good. Thank you for sharing. Koreans call it jook, too. Thanks for visiting. One of The Cat’s go-to quick meals. Eat well. Something to try! Thanks for sharing. I like soupy foods too, especially with no meat. Your blog is wonderful and thanks for liking my post. Thanks for stopping by. Eat well. No thanks necessary. Happy to read your blog. Eat well. I want the one The Cat’s father made. Yum Yum. I know. We miss him.